In the year 1666, a young Prince of Cats named Rand dwelt peacefully in Londontown with his beloved sisters, Jill and Colleen. He spent his nights at the theater, drinking in the works of Shakespeare, and had no interest in the day when he would be expected to rise up, challenge his father, and take his place as a King of Cats. For Rand, kittenhood was a wonderful dream, and one that he hoped would last forever. All stories have to begin somewhere, and this is where the story of Tybalt, King of Dreaming Cats, began: with a boy, and his sisters, and the city that he loved and never planned to leave. When duty calls, can he make the choice that will keep them all safe, without giving up everything that he has ever wanted from his life? Rat-Catcher is a short story that was originally published in the A Fantasy Medley 2 anthology but can also be read online for free on the Lightspeed Magazine website. I'm crazy about Tybalt so any story we can get from his point of view is a definite must read for me! 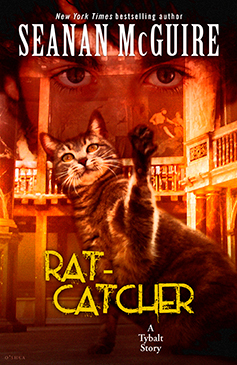 Rat-Catcher is actually set long before the main series starts (although I'd recommend reading at least Rosemary and Rue first so you're familiar with Tybalt's character) way back when Tybalt was still just a prince called Rand and his father was the King of Cats. I found it really interesting to see a younger, less confident version of Tybalt and I really loved the bond he shared with his two sisters. If you're familiar with the main series then you probably already know that princes have to kill the current king in order to claim the throne, in some cases princes challenge their king just because they long for power but that wasn't the case with Tybalt - he did it to protect his sisters and the rest of the Court of Cats which makes him the kind of leader that they both want and need. I really enjoyed this glimpse into Tybalt's past and I'm definitely looking forward to reading the rest of the short stories from his point of view!